The asthenosphere is the unsung hero of our planet. This plasticky layer 80 to 200 km beneath our feet provides the necessary lubrication for plate tectonics. That’s right. It’s the rigid lithosphere that we live in which rides on the asthenosphere. It’s because of the fluid-like properties that our crust to sit on top. The asthenosphere formed during a dramatic period of Earth heating. When the Earth started cooling down, solid continents began to rise up out of the mantle from plate tectonics. Since then, rocks have cycled from deep inside the Earth and up again as part of the rock cycle. Like a conveyor belt, continents have passively carried vast distances as part of continental drift. The asthenosphere is unique to our planet. Earth is the only planet in the solar system with an asthenosphere. If a planet doesn’t have water, this means it doesn’t have an asthenosphere. Likewise, without an asthenosphere, then there’s no mechanism that provides the necessary lubrication for plate tectonics. It’s the asthenosphere that’s vital to have plate tectonics. Volcanism means there’s mantle convection. For example, planet Venus has no sign of plate tectonics. Because Venus doesn’t have water, that means it doesn’t have an asthenosphere. It’s important to understand that the asthenosphere flows. Because particles can freely flow, convection cells can happen here. But in our rigid lithosphere (crust), it’s solid and particles cannot freely move. So the lithosphere just floats on top of the asthenosphere. 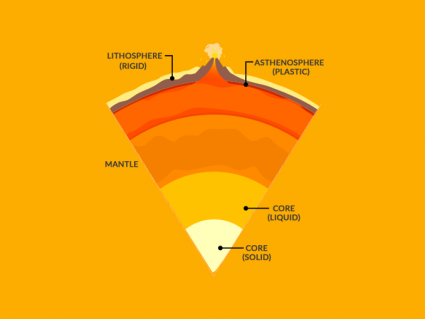 Mantle convection is the mechanism that tears the lithosphere apart. 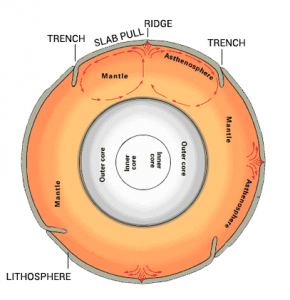 As mantle convection rises, it breaks apart the Earth to form mid-oceanic ridges (tensional force). When it sinks down, it breaks it apart (compressional force). These tensional and compressional forces are what drives plate tectonics. Plate tectonics breaks apart the whole lithosphere in 12 major plate tectonics. Each plate moves as divergent, convergent and transform plates. Rock in the asthenosphere is close to melting point. The temperature sits at around 1500°C, give or take 100°C. But it avoids melting because the pressure keeps it solid. For any type of rock, the melting point corresponds directly to the pressure exerted on it. The asthenosphere has a density of about 3.3 g/cm3. The crust which consists of rocks rich in silica has a density of about 2.5 g/cm3. And Earth density as a whole is about is about 5.513 g/cm3. Because of its buoyancy, the lighter lithosphere rock floats on top of it. Ice ages have put our planet into a deep-freeze. 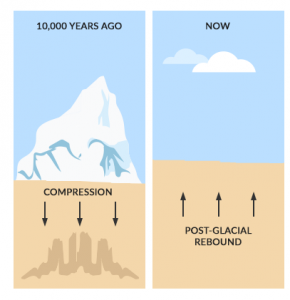 These bone-chilling temperatures have stacked kilometers of glacier ice. Because of the mass, the interior gets pushed in. It compresses the asthenosphere until it pushes it out-of-the-way. If you were to remove the ice, you’d find the actual surface to be below sea level. For example, Canada is still on the rise from the last ice age. We know this because we use GPS sensors to detect vertical motion. It’s rising because the asthenosphere rock is lifting again and flowing beneath. It’s flowing back up underneath slowly because ice is no longer compressing it. So again, rock in the asthenosphere is behaving in a fluid manner. By deforming like silly putty, glaciers gradually push down it. After the ice melts, it slowly rebounds. This process is isostatic rebound.